Kathryn Mary Garraway (born 4 May 1967) is an English journalist and is the entertainment editor of Daybreak, the weekday breakfast television programme for the British commercial ITV network. She also presented the UK version of The Biggest Loser. 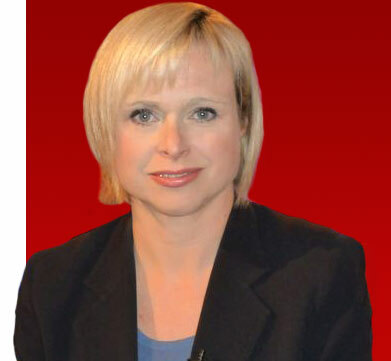 Anna Elizabeth Botting (born 4 May 1967 in Surrey, England) is a news anchor with Sky News, a broadcasting network based in the United Kingdom. Akiko Yajima is a Japanese voice actress from Kashiwazaki. Matt Crane is an American actor. Derek MacCready was a Canadian Football League defensive tackle. Michael Kauch is a German politician. Béla Glattfelder is a Hungarian politician. Outi Alanne is a Finnish writer. Ana Gasteyer is an American stage, film and television actress. John Child is a retired Canadian beach volleyball player. Jana Heczková-Madajová is a Slovakian ski mountaineer. Ken Rosato is an American journalist. Damon Packard is an underground American film director and actor. Kevin Dyson is a former Australian rules footballer. Haydar Zorlu is a Turkish-German actor. Riccardo Campa is Professor of Sociology at the University of Cracow. Sergey Mashnin is a professional association football manager from Russia. This entry was posted in Journalism, TV and tagged 1967, newsreader, presenter. Bookmark the permalink.